London to Edinburgh Adventure – The Great Canadian Travel Co. 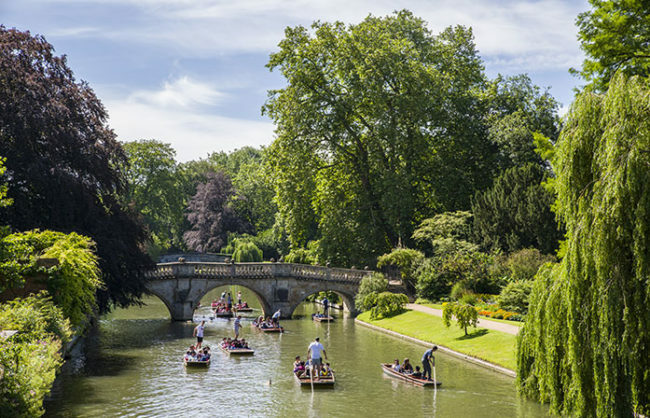 Discover Britain’s history on this comprehensive eight day tour from London to Edinburgh. 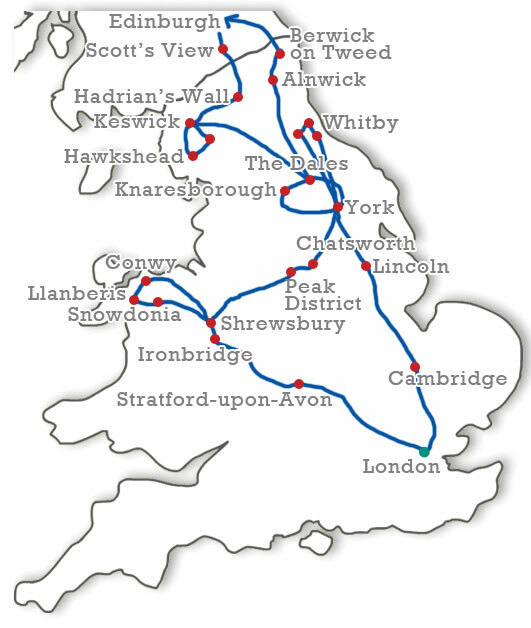 A combination of the “Heart of England, Wales & Yorkshire” and “Lake District” tours, it’s an unforgettable journey through a selection of the most scenic and historic locations in England, Wales, and Scotland. Explore the ancient Gothic majesty of the historic settlements of the North and the charming intimacy of its valley villages. 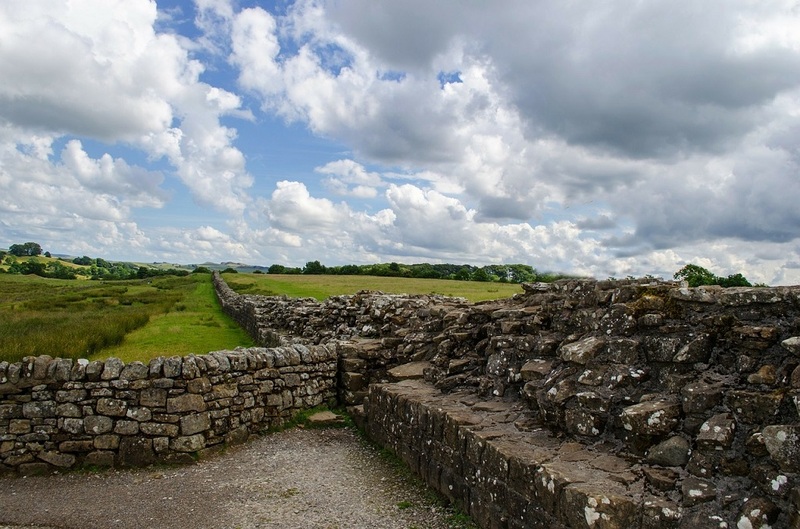 Relive the scene of fierce conflicts of the past as you wander the Roman divide of Hadrian’s Wall. Rates are shown in US$, per person, based on two people sharing a twin room and one person in a single room. Reduced rates are available for children ages 5-15, based on one child sharing a room with an adult or two children in a twin room. Canadian $ rates are also available – please inquire. Departing from London, you travel to the birthplace of William Shakespeare, Stratford-on-Avon. 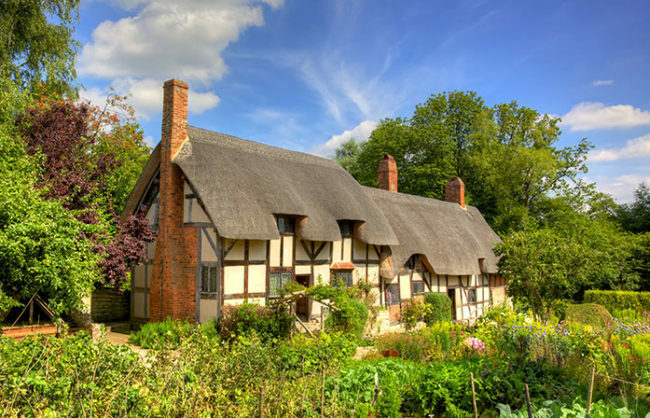 Home to the beautiful gardens and thatched Tudor cottage of his wife, Anne Hathaway, you have time to explore the charming village of Stratford. 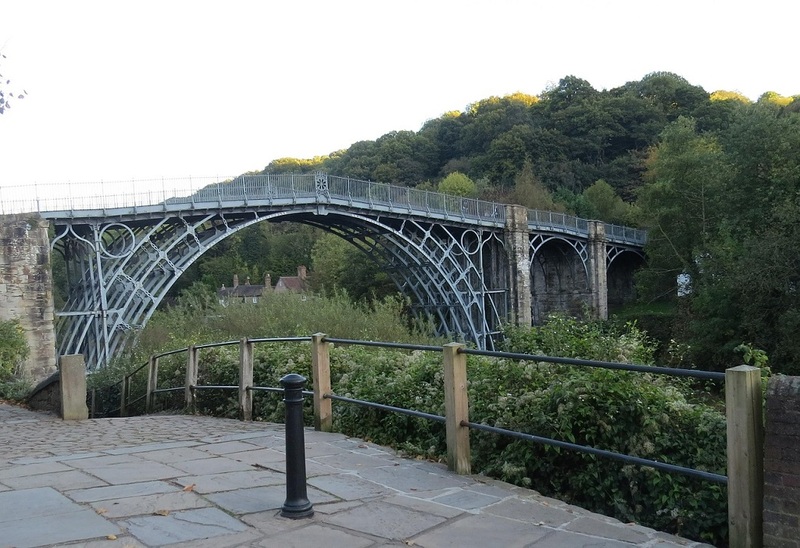 Enjoy lunch in one of the quaint restaurants before heading to the World Heritage site of Ironbridge, the world’s first ever bridge fully made of iron, set in a distinctive forested gorge on the River Severn. The amazing sights here were developed during the rise of Britain’s Industrial Revolution and there are many attractions within the site for you to learn more about this fascinating period. You then wind your way down to the riverside town of Shrewsbury, a pretty county town that lies on the banks of the mighty River Severn. The birthplace of Charles Darwin, this bustling market town and its timber framed black and white Tudor buildings are your home for the next two nights. Your tour takes you to the heart of North Wales today. Firstly, you explore the picture book beauty of Conwy and its picturesque medieval castle. Built by Edward I in the 13th century, this estuary fortress offers spectacular views from the battlements. Next you roam the impressive mountains and valleys of the Snowdonia National Park, delving into the massive Dinorwic slate quarries and the powerfully dramatic Pass of Llanberis under the shadow of Snowdon, Wales’ highest peak. Relive the struggle for Welsh independence and the rebellious tale of Owain Glyndwr, the last native Prince of Wales before heading back over the English border to your accommodation. Lying northeast of Shrewsbury are the incredible peaks and valleys of the Peak District National Park. Picturesque villages and unbeatable scenery line your route as you wind through the park’s inimitable landscape. After a visually spectacular drive, you arrive in the charmingly attractive village of Castleton, nestled in the Vale of Hope. Overlooked by Peveril Castle, this hospitable place offers a chance for a pretty picnic and to enjoy the fine local fare. In the afternoon, you make your way to the Duke of Devonshire’s famous mansion house and gardens at Chatsworth. Home to the Cavendish family, this renowned building is regularly named the UK’s favourite country house thanks to its fantastically large collection of furniture, priceless paintings, Old Master drawings and neo-classical sculptures. Travelling east from the estate, you pass through rolling green hills to the historic walled city of York, where you will spend the next three nights. Today there are two major options for the events of your day. Firstly, you can choose to spend the day leisurely exploring the medieval heart of York, an ancient city with a colourful history dating back to the times of the Romans, Vikings and Normans. The towering Gothic spire at York Minster rises above the city, casting its spirituality across the brilliant museums, narrow lanes and distinctive stone city walls. 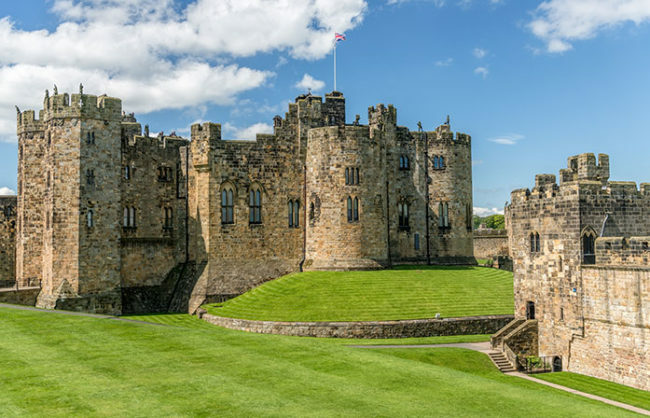 Alternatively, you could journey out with your guide on a half day excursion across the Yorkshire Dales to the handsome market towns of Knaresborough or Ripon. Take your time with the beautiful architecture and spa town luxuries on offer before heading to some of the more remote valleys and formidably impressive scenery of the Eastern Dale, followed by a free afternoon in York to dine and relax in the city’s plentiful restaurants and shops. You will leave the London based tour here and be picked up tomorrow by the tour bus from Edinburgh. Your driver/guide will let you know all the details of pickup times for the next day. A relaxing day that offers you the chance to spend time in the medieval city of York, a Roman settlement whose rich history includes Viking and Norman occupations and the brutally divisive War of the Roses. Take your time to discover the incredible city architecture, most notably the fabulous cathedral of York Minster. From here, you leave York and head to the North Sea coast of Yorkshire, with the first stop being the magnificently expansive North Yorkshire Moors National park. After relishing the abundance of nature and scenery here, you lunch in Whitby, a bustling fishing port and the inspiration for the fertile imagination of Bram Stoker, author of Dracula. Witness the Royal Hotel where he conjured his blood-curdling tale, then enjoy a little free time before travelling to the conservation village of Robin Hood’s Bay*, a pristinely preserved fishing village of winding lanes and narrow alleys. After relaxing in this unique location, you return to York for the evening. *The minicoach cannot access the main village because of local restrictions. The coach will drop you at the top of the village and you must walk down (and back up!) a steep hill to reach the old village centre. You move westerly into the superb scenery of the Yorkshire Dales National park, an area brimming with wildlife and rich cultural heritage. Densely packed with opportunities for recreation and relaxation, this nature haven gives unparalleled access to the North’s innate beauty. Continuing west, you pass through the Northern Dales, an Area of Outstanding Natural Beauty and the centre of the Dales energetic cattle trade. The last stop of the day is in the pleasant market town of Keswick**, where you will be dropped off at your accommodation, free to explore the charms of the area. **During July/early August this tour may stay in Windermere instead. After breakfast, you behold the mystery of the Castlerigg standing stones, built over five thousand years ago and the scene of many strange ancient rituals. Traveling on, you arrive by the shores of Ullswater, known was England’s most beautiful lake. A short walk along the shore and through a forest takes you to the mighty Aira Force waterfall, an excellent place for keen photographers. You head south over the snaking Kirkstone Pass, stopping at Windermere for the choice of relaxing with a hearty lunch whilst gazing across the region’s mountains and lakes or taking a leisurely cruise on the lake. Leaving this romantic setting, you head to the well maintained conservation village of Hawkeshead and the school where the renowned poet William Wordsworth attended grammar school. After a little spare time in the village, you navigate through the prim country lanes towards Grasmere, described by Wordsworth as “the loveliest spot that man hath found”. Visit the great man’s Dove Cottage or enjoy the peace and tranquility of the poet’s Daffodil Garden near the banks of the River Rothy before heading back to Keswick for the night. Waving farewell to the Lakes, you ascend the Hartside Pass, which boasts a famous view of the hills and mountains of Scotland and the English Lake District. Standing at over 1900ft, this is an inimitable experience. 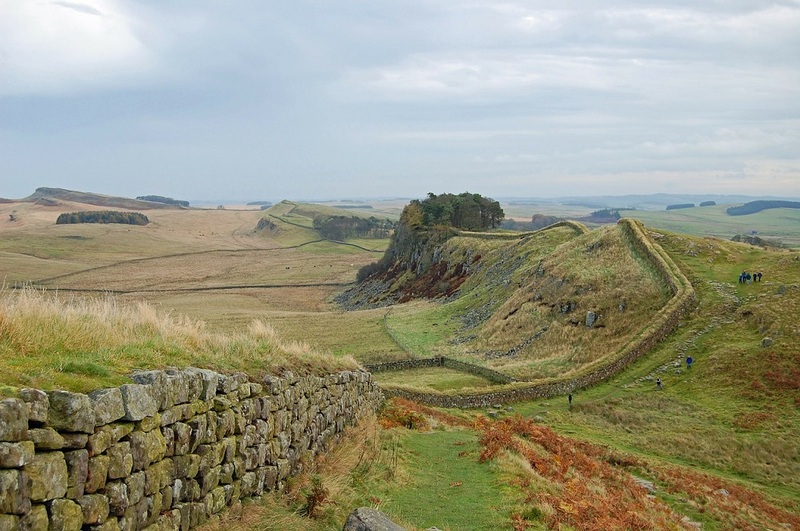 You continue to Hadrian’s Wall, the Roman Emperor Hadrian’s fortified construction designed to keep the Scottish tribes out of the Roman Empire. Roam in the footsteps of the Roman Centurions who patrolled this desolate frontier. Follow the ancient Roman Dere Street, then cross the border into Scotland and head to the local town of Jedburgh and the ruins of Jedburgh Abbey, where you stop for refreshments. 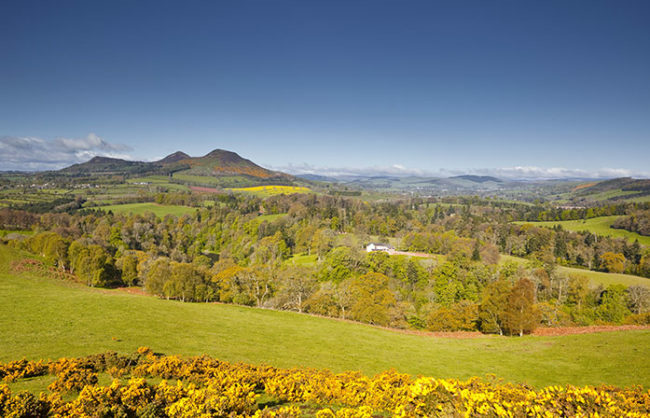 For your last stop, you make your way to the incredible Scott’s View, which looks out over the River Tweed and the Cheviot Hills which roughly form the Scottish-English border. You then make your way to the great city of Edinburgh. Add on some time in Edinburgh to complete this amazing program. We can arrange accommodation and tours for you in Edinburgh or out into the stunning countryside of Scotland. There are flights and trains operating from Edinburgh to many destinations in the UK and beyond.